As the US prepares to launch an attack in Syria, against the Assad regime which allegedly used chemical weapons against its own citizens, the debate has focused mostly on tactics and ethics rather than strategy. The British parliament decided against joining the Americans principally on the, rather sensible and practical, grounds that an air strike would be of little consequence and sending ground troops to Syria is out of the question. Critics of air strikes over the use of sarin point to the fact that the West has stood virtually idle as over 100,000 people have died during the Syrian civil war. Skeptics of assorted ideological persuasion underline the divisions within the Syrian resistance camp whilst warning that air strikes will empower extremist Sunni elements, i.e. the same kind of people who threaten the West with terrorism. Almost everyone (in the West) is tired of meddling in muslim Middle East. The record of disastrous interventions in Lebanon, Iraq and Afghanistan is too fresh and too vivid to be forgotten. And yet the US administration is poised for an attack. Why? The main argument of the Obama administration is that the West cannot sit idle while there is extensive use of chemical weapons. But this is a tactical argument; it implies that the West has a role as the watchman of the world. This is the implicit idea behind the current debate. It is this very idea that needs to be understood and addressed. 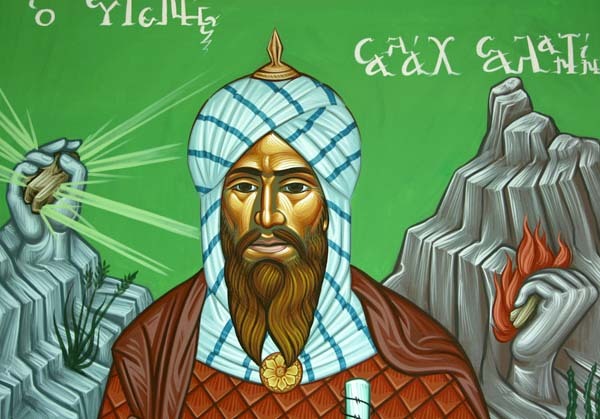 A beautiful, Byzantine-style, rendering of Saladin, the hero of Syria and of the Arabs. But let me say a few words about Syria first. I travelled there extensively in the 1990s, when the world was a different place. The memory of the Hama massacre was still fresh then, and the hold of the regime on the populace absolute. And yet I could see, very clearly, a new generation which was more educated, and more informed about world affairs, feeling uneasy with the status quo. As the years went by I had the opportunity to travel to many other Arab countries, where I saw the same thing: the tectonic forces that would bring about the “Arab Spring” gathered momentum as young people with access to the Internet felt deprived and oppressed under outdated, Cold War era, regimes. When the revolution started in Tunisia, it spread like wildfire. But instead of those youngsters claiming a new future, the past caught up with them. 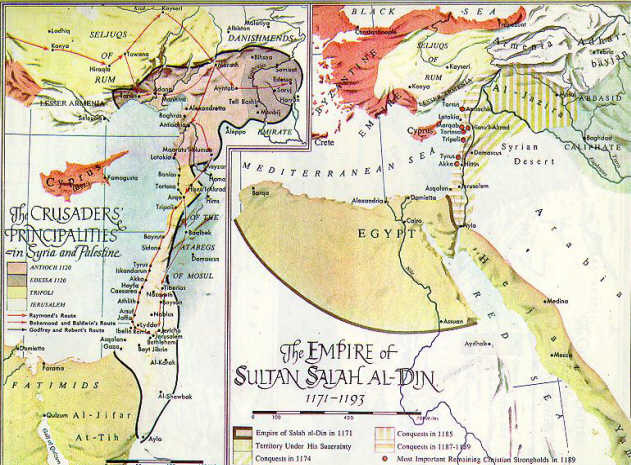 Divisions forcefully pacified by the Ottomans and, later, by western imperialist powers and nationalist regimes, resurfaced with a vengeance. The Arab world is nowadays torn by the unfinished war between Sunni and Shia; it will not find peace until this war comes to an end. Not unlike the religious wars of Christendom the Muslim religious wars will be bloody and protracted. It is a historical coincidence that the United States found themselves with a vast conventional army as the Cold War ended, and with presidents under the ideological influence of neo-conservatism. The demise of the Soviet Union gave the impression of the “end of history”. To the victor the spoils: international institutions are dominated by the West and built on western values and ideals. To many ideologues in the West, the West is therefore the keeper, the watchman, the policeman of the world. It is this self-appointed “manifest destiny” that gives West the “right” to intervene and “punish” whoever breaks its “laws”. I am of the West too. I am shocked and horrified by what goes on in Syria, as I was about what went on in the Balkans during the Yugoslavia partition wars. But I am afraid that the Syrian conflict will be the final curtain of western supremacy. The fact that the United Kingdom will not follow the US on this adventure is not a hiccup. Equally, when Obama asks Congress for approval for the attack (thereby relinquishing the presidential prerogative for taking military action) is not out of democratic politeness, as he claims. Both are historical signs of exhaustion. Signs that the governing elites of the West feel that they can no longer drag their unwilling populace into the high pastures of global glory and leadership. No matter what happens after the congressional vote (which most likely will support the President’s demand) the all-mighty West appears to have lost its will to fight. The West should not involve in Syria .The region can’t take another war. Terrorism will be defeated by terrorism itself.